Houzz is an amazing resource for finding inspiration for every inch of your home. 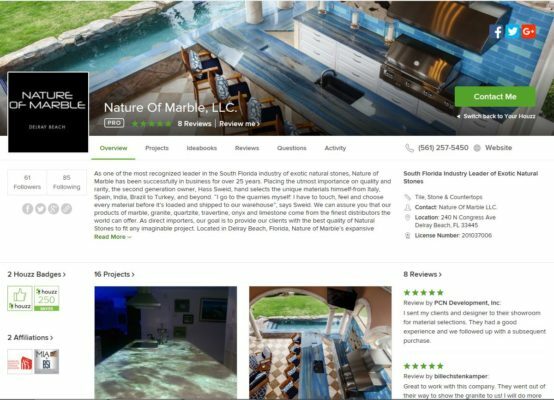 You can find Nature of Marble on Houzz! Together we can help show others what we worked so hard to create and inspire others. After your project is complete, take a few moments to post pictures of the final product and tag the product from Nature of Marble which helped to create your dream home! The process of taking an idea in your head to the final touches is hard work and something to be immensely proud of! When you share your project on Houzz, you are sharing a piece of the beauty that you created. Not to mention, Houzz is a great place to write reviews for contractors, fabricators, etc. Word of mouth is a large part of new business for companies like ours so if you are pleased with your final project, we hope you tell others about it on Houzz. Follow us to see our latest projects and products!